India’s working class – organised, contract and unorganised – has never been as defenceless as now. The once formidable trade union movements have wilted under the onslaught of globalisation and liberalisation, after economic reforms were initiated in the 1990s. The organised sector has shrunk, the contract and unorganised sector has grown exponentially. Outsourcing has become the mantra for managing hired labour and as the clamour for labour reforms increases in intensity, the terms on which labour will be hired and fired will change. This will put hired labour at a disadvantage and further reduce their capacity to bargain with employers, or rather contractors or sub-contractors or the endless layers of sub-sub-contractors. In 2012, the report of the committee on unorganised sector statistics, headed by Dr R Radhakrishnan, noted that “the unorganised or informal sector constitutes a pivotal part of the Indian economy.” The statistics are widely known: 90 percent and more of the work force can be categorised as unorganised; 50 percent of the national product is accounted for by the informal sector. Almost every worker in the informal sector is socially and economically underprivileged. The informalisation of the Indian economy has created a new dynamism, set up linkages between the formal and the informal, but the growth has been neither inclusive nor equitable. The growth of the informal sector with all its uncertainties and insecurity is a consequence of “jobless growth”, with total employment growing by 1.1 million in the five-year period from 2004-05, according to an International Labour Organisation report. Unemployment is very high, averaging nearly 20 percent for the age group of 15-24 years. In any other country, including the citadel of capitalism, the US, unemployment, jobless growth and youth unemployment are a major political issue. It is in fact an integral part of conservative, mainstream politics, with Democrat and Republican politicians advocating different solutions to the problem. In contrast, in India, the issue is rarely mainstream, even for the two communist parties that are ideologically committed to the poorest of the poor, which axiomatically makes them critics of globalisation. The prime minister’s vision, “We have to increase manufacturing and ensure that the benefits reach the youth of our nation”, is in effect a means of selling India as a source of cheap labour to the world, replacing China, where the cost of labour has shot up. A report by the Boston Consulting Group estimates that the per-hour cost of labour in India is 92 cents to 3.52 dollars in China. For companies looking for low-cost alternatives, a Bloomberg report quotes Frederic Neumann, a senior economist with HSBC: “It’s the only country that has the scale to take up where China is leaving off.” Behind this seductive formula for realising India’s potential as an economic powerhouse is an agenda that will change the labour laws by taking out more than 80 percent of the factory workers from their purview, according to trade unions. It is not as though the working class is without its advocates. It is a pity that the advocates have been so ineffective. The combination of alarm and anger that pushed the central trade unions, spanning the Bharatiya Mazdoor Sangh (BMS), the BJP’s trade union arm, on the one end and the Centre of Indian Trade Unions (CITU), affiliated with the CPM, at the other, to mobilise at Jantar Mantar in New Delhi for a National Protest Day on December 5, 2014 against the Modi government’s policies for changing labour laws has not evolved into a sustained movement required to challenge the direction of change captured in the slogan ‘Make in India’. The effects of political and policy changes on labour require the Left, led by the CPM and its trade union arm, the CITU, to lead a movement to defend the rights of workers. The call of ‘Communist Manifesto’ – “Workers of the world unite” – ought to inspire the Left trade unions to confront the government, inside and outside parliament. The reduction of membership strength of the CPM and CITU to 55 lakh is evidence that it has failed to confront the brutality of informalisation of the Indian economy and effectively oppose labour law amendments, by building up a movement of the working class. Instead, the CPM has consoled itself by interpreting the problems facing labour in India today. Drawing a distinction between the post-independence mantra of Made in India and Modi’s Make in India, Sitaram Yechury, who has just taken over as the CPM’s new general secretary, said in 2014 that the difference lies between strengthening India’s industrial base and issuing “an open invitation to foreign investments” to maximise profits, not augmenting India’s productive capacities. This line of least resistance is startlingly contrary to what Karl Marx had urged: to change the world instead of merely interpreting it as philosophers do. In order to change the ways of the Modi government and its trademark concept of Make in India, that champions converting India into an alternative manufacturing base for global investors by offering an endless supply of cheap labour, the Left and other trade unions have to put together a more robust opposition than a National Protest Day. Worse still are the feeble efforts at defining what should be a changed world. When the rest of the world, including the US, is politically addressing the negative effect of economic recovery on unemployment as part of an “establishment” critique of government and governance, the failure of the Left in India to address the issues with far more force is a mystery. The timidity with which the trade unions have attempted to draw attention to the changes in the labour laws that restrict unionisation, disempower trade unions in negotiating over disputes, and manipulate the Apprenticeship Act to convert skilled and semi-skilled labour into low paid irregulars of the work force is a measure of political weakness. Parties that have by history and tradition crafted their politics to mobilise the working class, employed in the organised, unorganised and agricultural sectors, have moved away from the centre stage of Indian politics to the periphery. The CPM in 2004 was a political force; in 2015, it is struggling to survive as a relevant, credible representative of the working class. The problem lies within the CPM and by extension, CITU. Over the years, in state after state, CITU has neither incubated nor inducted the quality of leadership that is necessary to give direction to a growing working class, comprising mostly youth. The chronic nature of the crisis of employment in India appears to have exhausted the trade unions’ capacity to organise and include those joining the informal sector on terms that are exploitative and brutal. In West Bengal, where CITU was a formidable force, the red flag is faded and drooping. 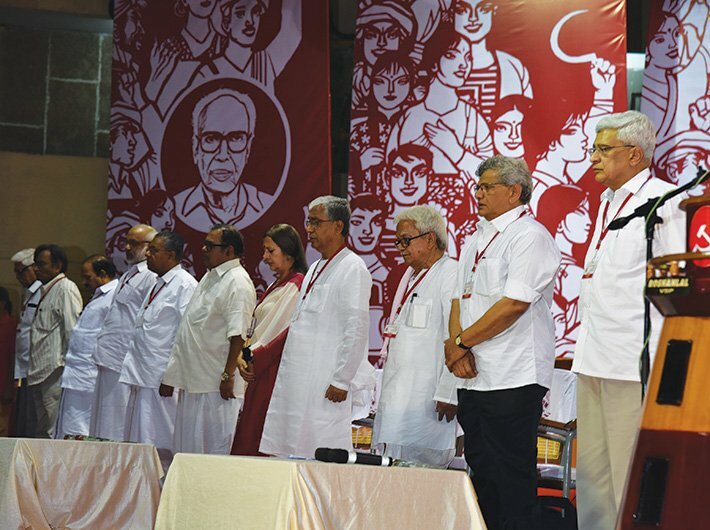 The disconnect between the organisation and the working class is evident in the heavy losses the CPM has suffered in all the elections in the past five years in what were once its citadels in the industrial belts of Durgapur, Asansol, Howrah, Barrackpore, Titagarh, and Budge Budge. The working class has lost faith in CITU and by extension the CPM, or it could be the other way round. But the evidence from West Bengal is only one instance of the shrinking territorial space occupied by CITU and other Left trade unions. Mumbai’s industries were once upon a time controlled by the Left trade unions and the Indian National Trade Union Congress (INTUC). The informal sector that has replaced the old textile mills is no longer controlled by INTUC or CITU or AITUC. In failing to change with the changes that have happened since the 1990s the CPM and its trade union, as well as the Left, have failed to correctly analyse the concrete conditions and develop an organisational and political capability to deal with the crisis of labour. Instead of finding ways to change the flow of events, the Left trade unions seem to have been swept aside, outmanoeuvred and outclassed by its class enemies – capitalists and neo-imperialists. In 2005-06, Prakash Karat, the then general secretary of the CPM, tried to organise the contract workers in the IT industry. He made a few speeches and then he was forgotten; the youth preferred the punishing terms of employment to the meandering thoughts of Karat. As India prepares to open its doors to investors in manufacturing via Make in India, the trade unions seem to have made themselves entirely dispensable to the new discourse on the terms of employment.